Orange County County has many outstanding legal professionals with impressive records and equally impressive stories of accomplishment to share. 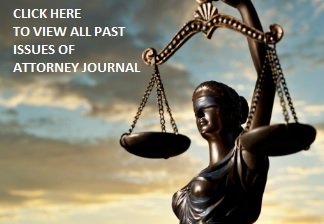 Attorney Journal (aka Attorney Journals) wants to feature the best of the best. Attorney Journal features a top attorney and/or law firm on the cover each month along with inside feature stories on other legal professionals and/or companies. We highlight the unique offerings of the professionals and/or businesses we profile including their history, areas of expertise, unique selling proposition (USP), stories of success and how to contact them to learn more. Criteria for Cover Story – "Attorney of the Month" or "Law Firm of the Month"
To be considered for the cover story, an attorney and/or law firm must have excellent reputations and possess qualities that distinguish themselves within Orange County’s legal community.